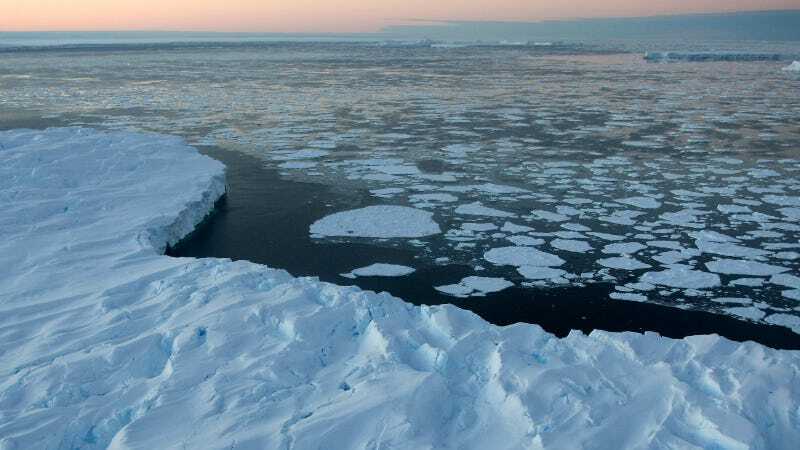 According to a new study published in Nature Geoscience Monday, we should expect to see Antarctic ice shelves melting at double the rate they are now within 35 years. That's bad news. Under the high emissions pathway by 2100, melt on several ice shelves approaches or surpasses intensities that have historically been associated with ice shelf collapse, at least on the northeast Antarctic Peninsula. And the National Snow and Ice Data Center (NSIDC) offer that ice sheets also affect the weather, explaining, "large high-altitude plateaus on the ice caps alter storm tracks and create cold downslope winds close to the ice surface." We've already seen the effects of rising sea levels in the form of super storms like Hurricane Sandy, explains Climate Central. The paper's lead author, Luke Trusel, commented that the "results illustrate just how rapidly melting in Antarctica can intensify in a warming climate." Co-author Karen Frey continued, "The data presented in this study clearly show that climate policy, and therefore the trajectory of greenhouse gas emissions over the coming century, have an enormous control over the future fate of surface melting of Antarctic ice shelves." She added, "which we must consider when assessing their long-term stability and potential indirect contributions to sea level rise."